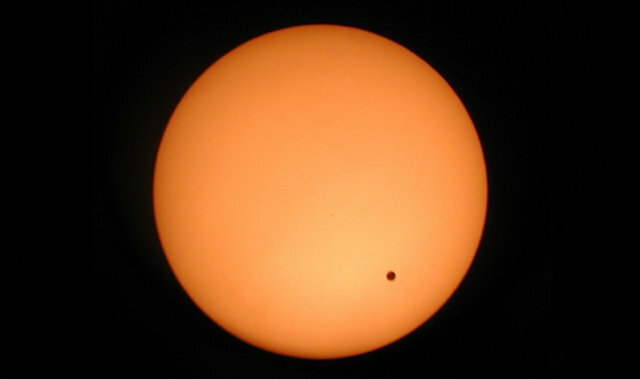 The little black dot is Venus as it transits in front of the sun. You don’t have to be an astrologer or astronomer to appreciate the fact that this astronomical event is a once in a lifetime event June 5th to June 6th, 2012. It will not happen again in our lifetimes as the next one will not be until 2117. If you’re a believer in the power of planetary alignments, the ancient Mayans predicted this Venus transit to be the beginning of the great “shift” that would lead up to the much hyped 12-21-2012 time frame. This event of Venus passing in front of the sun, much like an eclipse but, without the blocking of the sun, happens only every 121.5 years or so. That means that we’ve only had it happen 6 times in recent human history. This will be the 7th time and none of us reading this, will live to see the next…unless of course, there are some pretty big advancements in the lengthening of human life throughout the next 120 something years. Who knows? It could happen. However, for us, living here today, this will be the one and only chance we’ll have to witness this event. Venus is thought of as the feminine. It brings about love, nurturing and the feminine creator. It’s about bringing forward our inner selves, knowing oneself and caring for self as well as others. It’s thought to bring forth a nurturing side within us towards ourselves, each other and the world. It is said to be “no ordinary time in life”. It is thought to be a time of hope, goals, aspirations and love. It’s a time to plant seeds and watch them grow within ourselves and our lives and it’s believed that what you put out into The Universe in terms of wishes, hopes and aspirations are stronger than usual in being heard. (Be careful what you wish for may apply). It is also thought to be a time of great creativity so, artists and entrepreneurs alike, get out your tools and get to work. Thought to be a time of love, unity and displays of those qualities, it’s interesting to note that the Taj Mahal was built during the Venus Transit of 1631-1639 AD and stood as one of the greatest monuments to love. It is believed to be the door that opens into the Age of Enlightenment in all ways. Having written this blog entry, during the 6 hour period in which Venus is transiting across the sun, knowing that it will not be seen again until 2117, I am at the least, in awe of the event, itself. What comes out of it, is anyone’s guess or based upon your beliefs. Would I have known I was being enlightened if it weren’t for astronomers, astrologers or the media? No. Would I care that it had happened? No. Do I care now (that I know)? I can only hope that the Ancient Mayans were right in the aspect that there will be a new softer world, people awakened to good and the world will be a better place because of it. Do I believe that this is the beginning of this awakening and leading up to something different happening December 21, 2012? Not really, but one can hope. I’ll still have to work tomorrow.